Symptom: You find yourself very busy at work, with a lot of things to do and crises to manage, but you never quite seem to advance, and the situation never quite seems to improve for you or your peers. Cure: Turn all your activities into projects, so that you can work toward stated goals within time, budget, and specification constraints that everybody acknowledges. Whatever can't be turned into a project is a candidate for your "stop doing" list. Why it Works: You must avoid working on "projects" that lack specifications. People doing things without a spec are not working on a Project -- they are engaged in Activity, or perhaps a Lame Project. Unlike a Lame Project, which might produce some (sub-par) results someday, activity never produces results. Activity cannot produce results, because there is no Goal (Spec) by which to judge success. Activities are Doomed to fail. You don't want to be around them, they are bad for your career. 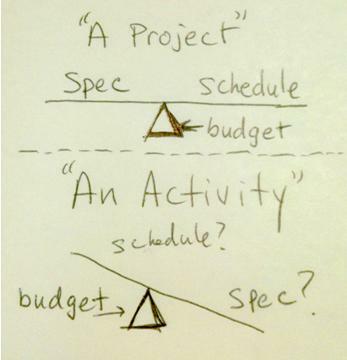 Activities lack a Spec and/or Schedule and/or Budget. Either create a spec if one does not exist, force the project leader or project manager to create one, or run away from activity that is not spec-driven. Your career will be better off for it. The paradox, of course, is that engineering or development or whomever is doing the actual work must have a precise spec to design against, or else the project cannot be executed in a way that will be successful. And, it also is true that the customer's reaction to your spec is uncertain. So if the spec you design to is wrong, you will also not be successful. But hey, no risk, no reward! What do we pay marketing people for anyway? The role of Marketing is to see through the murk, take the calculated risk, and define the future. If you are a designer, make them do their job and define a spec for you! Don't accept anything less! If you are a marketer, stick your neck out and define what you want, don't be wishy-washy! Or better yet, work together to define something that your company can sell and you can produce in a reasonable time, for a profit. People that can do this are truly valuable, and will be the ones that advance their career within the company. Did this tip inspire you to turn your activities into projects? Then tell your friends! Like, Share, Tweet, or Email below! Copyright 2011- present, Simple Chief, www.SimpleChief.com, All Rights Reserved.